Symphony No. 2 in D major, Op. 73, was composed by Johannes Brahms in the summer of 1877, during a visit to Pörtschach am Wörthersee, a town in the Austrian province of Carinthia. Its composition was brief in comparison with the 21 years it took Brahms to complete his First Symphony. The symphony is scored for 2 flutes, 2 oboes, 2 clarinets, 2 bassoons, 4 horns, 2 trumpets, 3 trombones, tuba, timpani, and strings. 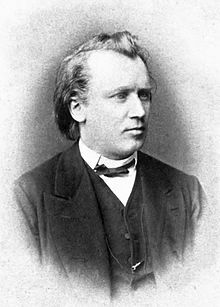 The cheery and almost pastoral mood of the symphony often invites comparisons with Beethoven's Sixth Symphony, but, perhaps mischievously, Brahms wrote to his publisher on November 22, 1877, that the symphony "is so melancholy that you will not be able to bear it. I have never written anything so sad, and the score must come out in mourning." The premiere was given in Vienna on 30 December 1877 by the Vienna Philharmonic under the direction of Hans Richter; Walter Frisch notes that it had originally been scheduled for 9 December, but "in one of those little ironies of music history, it had to be postponed [because] the players were so preoccupied with learning Das Rheingold by Richard Wagner." A typical performance lasts between 40 and 50 minutes. The cellos and double-basses start the first-movement sonata form in a tranquil mood by introducing the first phrase of the principal theme, which is continued by the horns. The woodwinds develop the section and other instruments join in gradually progressing to a full-bodied forte (at bar 58). At bar 82, the cellos and violas introduce a new theme in F-sharp minor, which eventually moves to A major. After a development section based mostly on motives of the principal theme group, the recapitulation begins at bar 302, with the second theme returning at bar 350. Towards the conclusion of the movement, Brahms marked bar 497 as in tempo, sempre tranquillo, and it is this mood which pervades the remainder of the movement as it closes in the home key of D major. Brahms bases much of the first movement on a melody he formerly composed for Wiegenlied, Op. 49, the tune commonly referred to as "Brahms's Lullaby". It is introduced at bar 82 and is continually brought back, reshaped and changed both rhythmically and harmonically. This movement is characterised by the use of developing variation. A brooding theme introduced by the cellos from bars 1 to 12, with a counter-melody in the bassoons, begins the second movement (also in sonata form). A second theme, marked L'istesso tempo, ma grazioso, appears in bar 33. After a brief development section, the recapitulation is highly modified. The movement then finishes with a coda-like section in which the main theme is reintroduced in the end. 8 variation. Brahms yet again diverts the movement back into its principal tempo (bar 194) and thereafter to its peaceful close. The third movement contains very light articulated sections, very similar in character to the Slavonic Dances of Brahms' contemporary, Dvořák. This lighter element provides a contrast to the previous two movements. Busy-sounding (but quiet) strings begin the final Allegro con spirito, again in sonata form. A loud section breaks in unexpectedly in bar 23 with the full orchestra. As the excitement appears to fade away, violins introduce a new subject in A major marked largamente (to be played broadly). The wind instruments repeat this until it develops into a climax. Bar 155 of the movement repeats the symphony's first subject again, but instead of the joyful outburst heard earlier, Brahms introduces the movement's development section. A mid-movement tranquillo section (bar 206, and reappearing in the coda) elaborates earlier material and slows down the movement to allow a buildup of energy into the recapitulation. The first theme comes in again (bar 244) and the familiar orchestral forte is played. The second theme also reappears in the tonic key. Towards the end of the symphony, descending chords and a mazy run of notes by various instruments of the orchestra (bars 395 to 412) sound out the second theme again but this time drowned out in a blaze of brass instruments as the symphony ends in a triumphant mood. ^ Brahms, Johannes (1974). Hans Gál (ed.). Johannes Brahms: Complete Symphonies in Full Score (Vienna Gesellschaft der Musikfreunde Edition). New York: Dover Publications, Inc. p. 87. ISBN 978-0-486-23053-5. ^ "NPO Programme Notes: Johannes Brahms – Symphony No. 2 in D, Op. 68". Nottingham Philharmonic Orchestra. This page was last edited on 27 May 2018, at 23:21 (UTC).